Federal minister fro WAPDA Khawaja Muhamamd Asif has announced eid bonus to the employees of WAPDA. THis announcement made in the presence of Hydro Union delegation headed by labor leader Khurshed Ahmad Khan. The implementation of the this orders has been started. Following are the notification issued by distribution companies of the WAPDA. 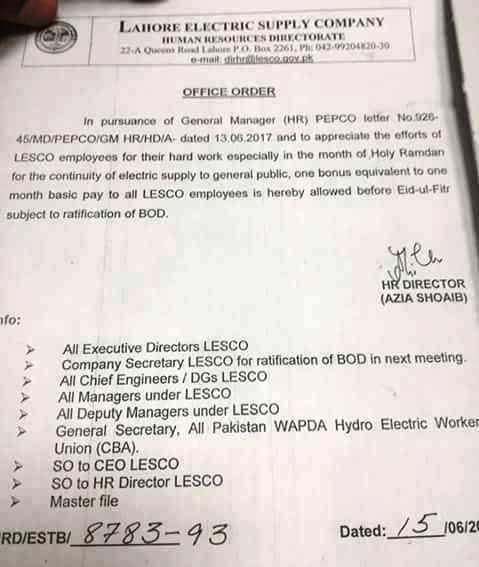 The employees of LESCO and FESCO will get eid bonus equal to one basic pay. In pursuance of General Manager (HR) PEPCO Wino No 020. 4SAID/PEPCO/GM MR/HD/A. doted 13.06 2017 and to appreciate the efforts of the LESCO employees for their herd work especially in the month of Holy of Ramzan, for the continuity of electric supply to general public, one bonus equivalent to one month basic pay to all LESCO employees Is hereby allowed before Eid-ul-Fitr subject to ratification of BOD. 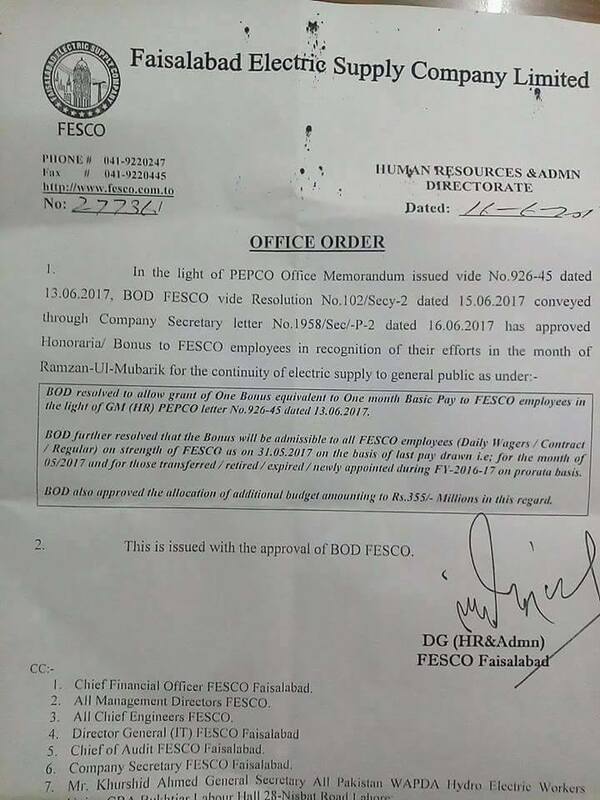 ROD resolved to allow grant of One Bonus equivalent to One month Basic Pay to FESCO employees in the light of GM (HR) PEPCO letter No.926-45 dated 13.06.2017. BOD further resolved that the Bonus Ivill be admissible to all PESCO employees (Daily Wagers / Contract / Regular) on strength of FESCO as on 31.05.2017 on the basis of last pay drawn Le; for the month of 05/2017 and far those transferred / retired /expired / newly appointed during F1.-2016-17 on prawn: basis. 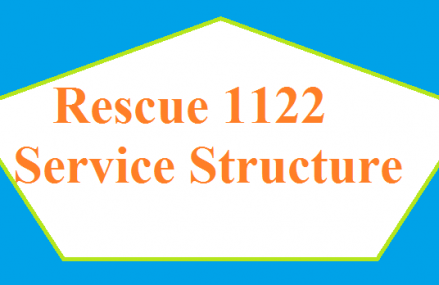 This is issued with the approval of BOD FESCO. Eid Bonus Notification Copy of LESCO and FESCO..